Don’t let the fear of falling get you down! Sometimes feel unsteady or weak when standing or walking? Rely on a walker or cane? Rely heavily on furniture and doorways to help you move around your home? Avoid activities because you are afraid of falling and injuring yourself? If you answered “yes” to one or more of these questions, you may have a balance issue and suffer from “fear of falling,” — a real medical diagnosis and an incredibly common condition that affects millions of seniors. Because many people assume that feeling “unsteady” is an inevitable part of aging, balance issues often go unnoticed until a serious fall-related injury occurs. Equally tragic is that the fear of falling itself may be causing you to give up the activities and independence that are so essential to enjoying a normal, healthy life. With the ProFitness “Balance Fit” program, you can regain your mobility and confidence and get back to enjoying your life again. Your experienced physical therapist performs complete strength testing and a comprehensive neuromuscular evaluation to assess the extent of your balance issue. 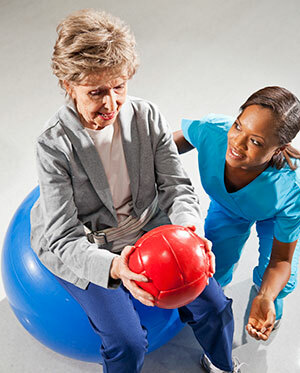 The results are used to design a customized rehabilitation program to restore your balance and your confidence. As a result, you’ll enjoy a dramatic improvement in your daily life while greatly reducing your risk of falling. At ProFitness, we give 100% of our expertise and effort to every patient at all times. This means that your dedicated physical therapist works one-on-one with you through every minute of every rehab session – providing expert assessment and guidance, and constant encouragement and support. In other rehab facilities, you may not always work with the same physical therapist, or you may work with a PT assistant instead. And often, your therapist may work with several other patients at the same time. These factors can make it difficult to get the level of care you need to achieve your goals. That’s why our care is always provided ONE therapist to ONE patient. ONE at a time. EVERY TIME. It’s the ProFitness AdvantageSM. And it’s what helps us achieve such excellent results. For more information on balance, download this brochure.